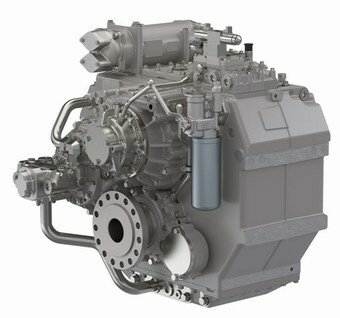 The new ZF 5000 series transmission features advanced design and technology to meet the changing requirements and demands of ZF Marine customers and survey society organizations. During the development of these transmissions, significant gains have been made with regard to power capacity, and available ratios due to the product improvements incorporated into the new ZF 5000 family. The ZF 5000 series transmissions are characterized by low noise gear design, pinion friction bearing, excellent shifting comfort and short engagement times, all while providing a large number of variants in a highly compact design. A variety of accessories and low maintenance demands are all in line with the rigorous requirements of engine manufacturers and shipbuilders alike. The ZF 5300 series offers larger offset and gear ratios of up to 5,5:1. They can be equipped with an additional Power Take In (PTI) and therefore offer a ‘hybrid-ready’ option. The new transmission series is completed by the availability of non-reversible (NR) versions, with either vertical or horizontal offset. The ratings of the ZF 5000 series transmission are aligned to those of the proven ZF 4600 transmission family. The ZF 4600 series has been widely successful over the past 30 years and will gradually exit the ZF Marine product portfolio with the arrival of the new ZF 5000 series. Replacement units and service parts for the ZF 4600 series will continue to be available through ZF Marine’s aftermarket service network, with over 25 wholly owned Sales and Service Organizations and over 500 authorized worldwide service dealers.